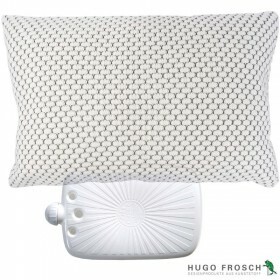 Original Hugo Frosch white hot water bottle is the authentic “Made in Germany” classics of top quality. Advanced technologies, innovative materials and absolute commitment to safety are combined together to give you a truly distinctive hot water bottle that will keep you safely warm on a chilly night. 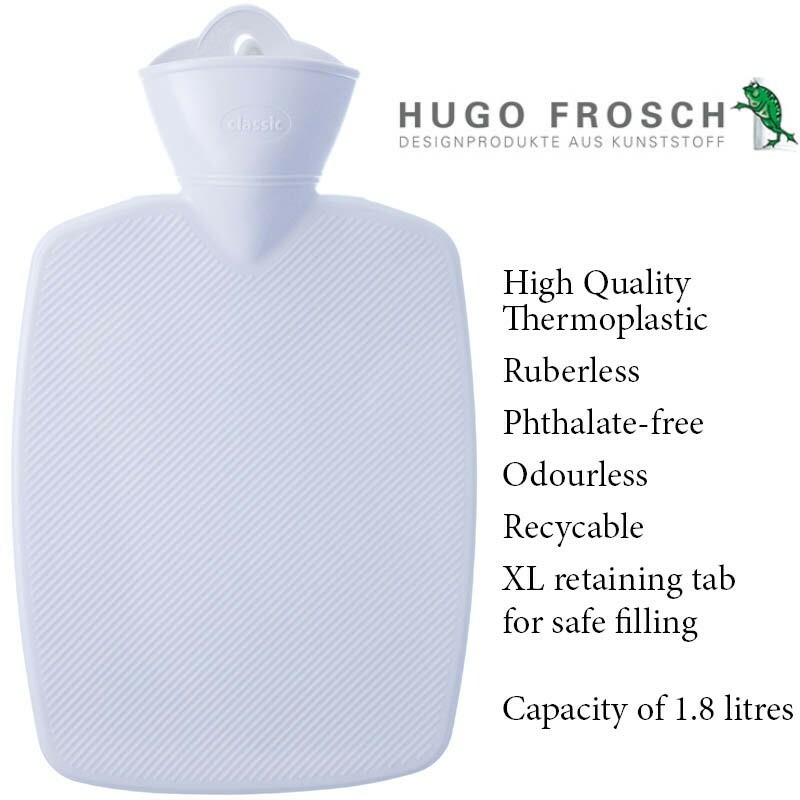 Unlike conventional rubber heat packs, Hugo Frosch hot water bottles are crafted using high quality thermoplastic, and therefore they are much more durable and free from rubber fumes. 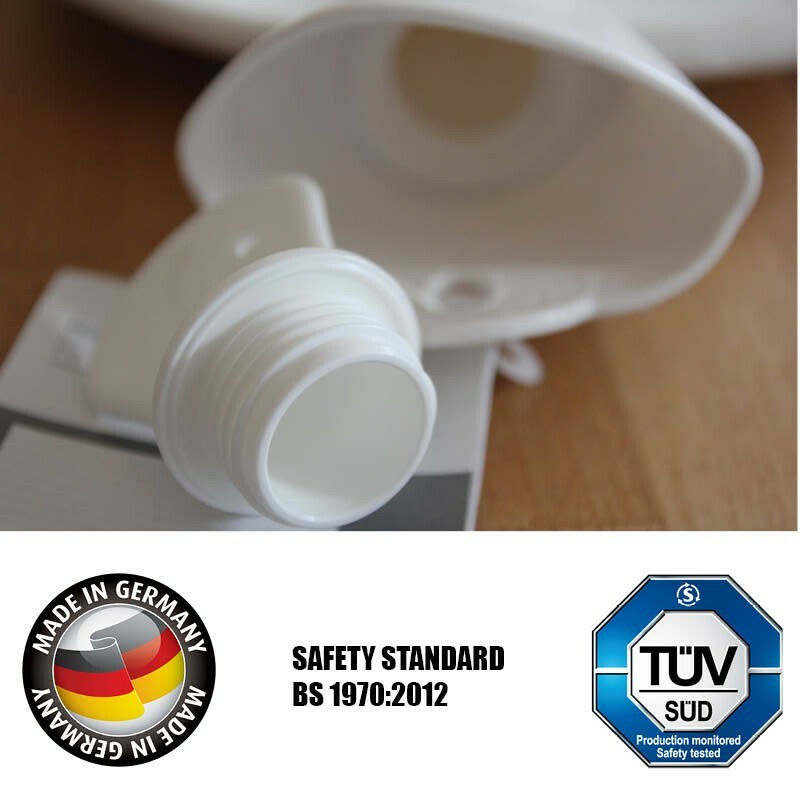 Their safety has been independently verified by the British Standard BS 1970:2012 and you can use them with peace of mind they won't leak (provided they are strictly used as per the manufacturer's guide). Every piece comes with two years water tightness guarantee as reassurance of superior quality. 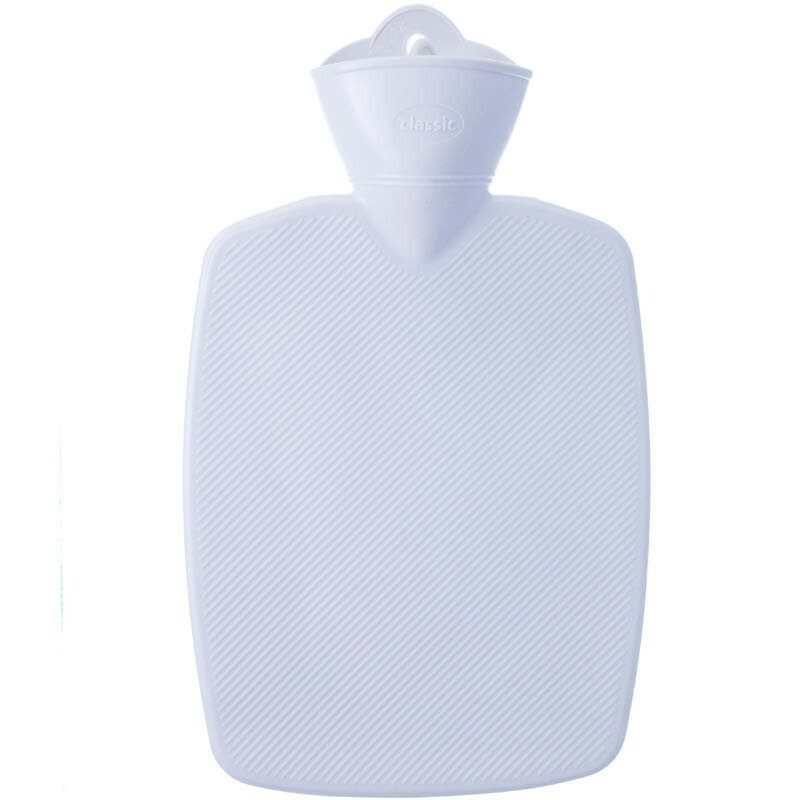 Thanks to the grooved surface, Hugo Frosch classic hot water bottle doesn't slip and is very comfortable to handle. It's a great replacement of your old hottie and all you need to do is just put on a towel or a cover. Trust only the best and reliable quality close to your skin and let the stress and cold go away. For over 20 years, Hugo Frosch has been advancing the good old hot water bottle to offer you the best and reliable quality for warming up on a cold winter day. 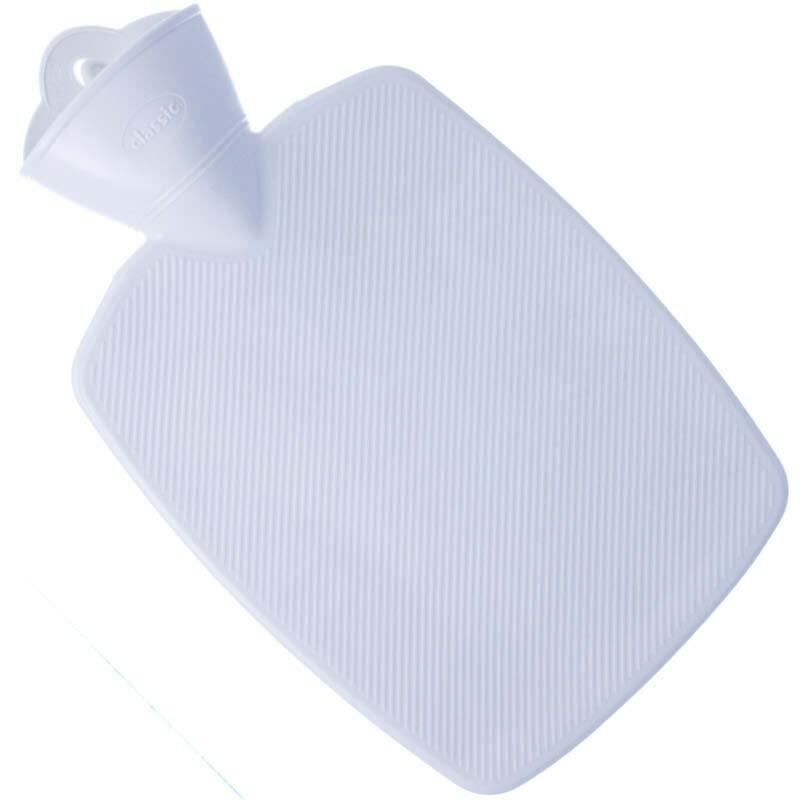 Classic white hot water bottle by Hugo Frosch is the symbol of top performance, durability and safety. It is expertly crafted in German Bavaria from top grade thermoplastic without harmful substances and rubber smell. 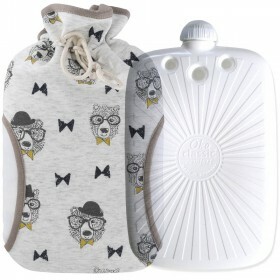 Hugo Frosch hot water bottles have been independently safety tested and meet British Standard BS 1970:2012, which means they are leak proof and can be used safely. Their safety is further enhanced by two years warranty and you can just cuddle them and feel homey and warm despite the cold winter weather. Extra large mouth makes filling with hot water easy and safe. Use it when you old hottie is due for a replacement. It comes without the cover and must be wrapped in a towel or a cloth to protect your skin and ensure slow heat release. 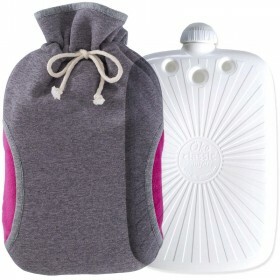 Embrace winter with the Hugo Frosch hot water bottle and enjoy feeling warmth and comfortable.